This is the first in a series where we share personal accounts from couples that have been married on Maui and all the fun that surrounds it. Let us know if you’d like your story shared! All photos by BGI Photography. 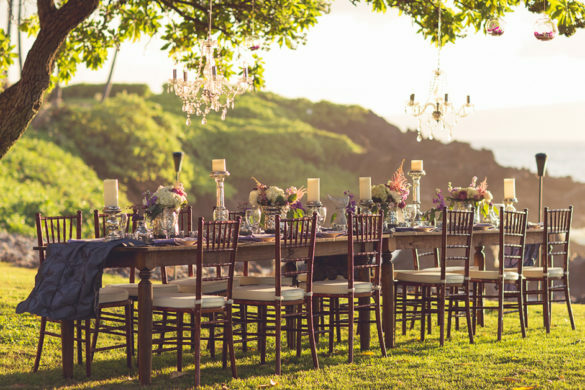 Trista and Michael first visited Maui in August 2015 and immediately knew “when” they got married, it would be on Maui – specifically after they hiked the island and visited just a small portion of its beauty. The first time there they spent 10 days, and it was not close to enough! They visited Makawao Jewelers and Trista fell in love with a set of orange garnets that John was selling. Needless to say, they both were not ready to tie the knot yet, but Michael KNEW he had to get that stone for her. So, when he eventually proposed, she would have it and specifically remember their first Maui trip together.